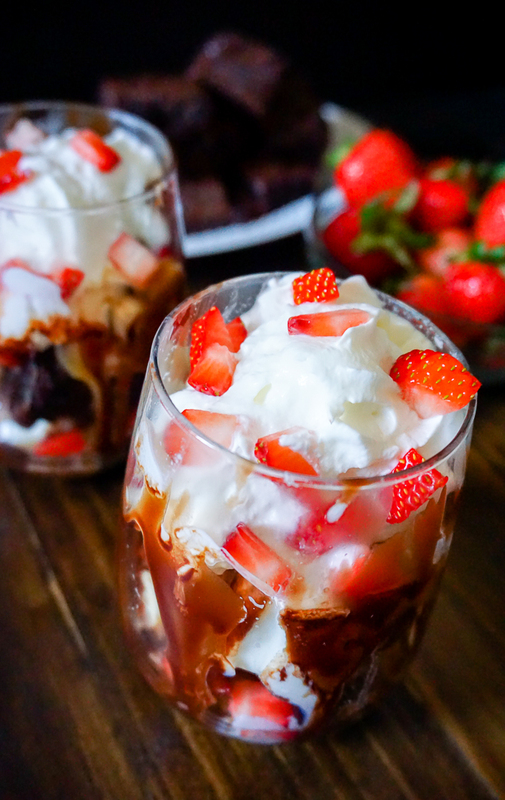 Strawberry and Banana Brownie Sundaes are the perfect warm day dessert! 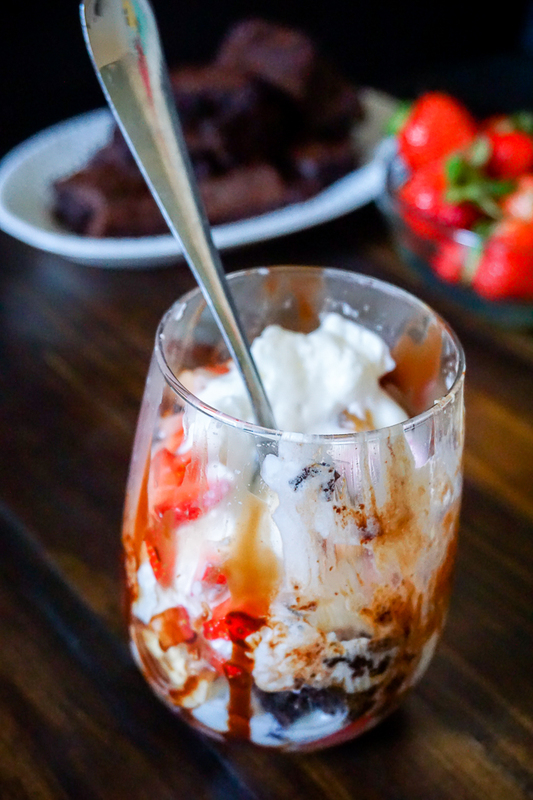 This weekend was our first really beautiful spring weekend and I decided to celebrate with ice cream – Strawberry and Banana Brownie Sundaes to be exact! It’s been a crazy few days lately since I was preparing to host a bridal shower Saturday, so Bryan and I hadn’t spent a lot of time together. Sunday was our day to relax and hang out. I had stocked up on Pillsbury supplies for my pantry a few weeks ago, so I had a box of Pillsbury Dark Chocolate Brownie Mix calling our names. We quickly whipped up a batch of brownies together, which are addicting all on their own by the way. It was fun to chat over baking! THEN, after we let them cool and enjoyed some warmth and sunshine, we came in to layer up our Strawberry and Banana Brownie Sundaes. Let me skip ahead and say they were amazing!! This was an awesome trial run for our spring and summer get togethers! 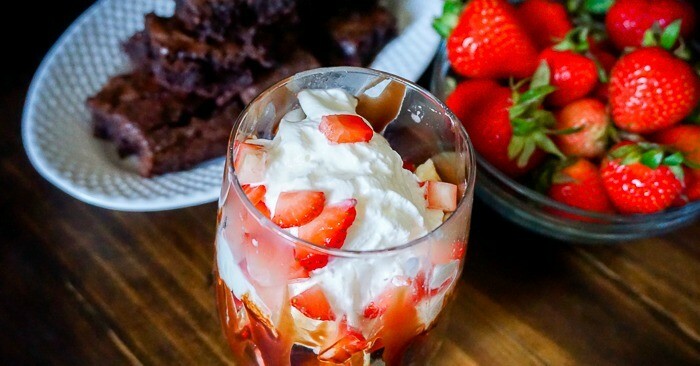 We often host our friends for dinner and lawn games and we are always looking for new dessert options when we spend a day poolside with the family, too, and these Strawberry and Banana Brownie Sundaes are the perfect option. 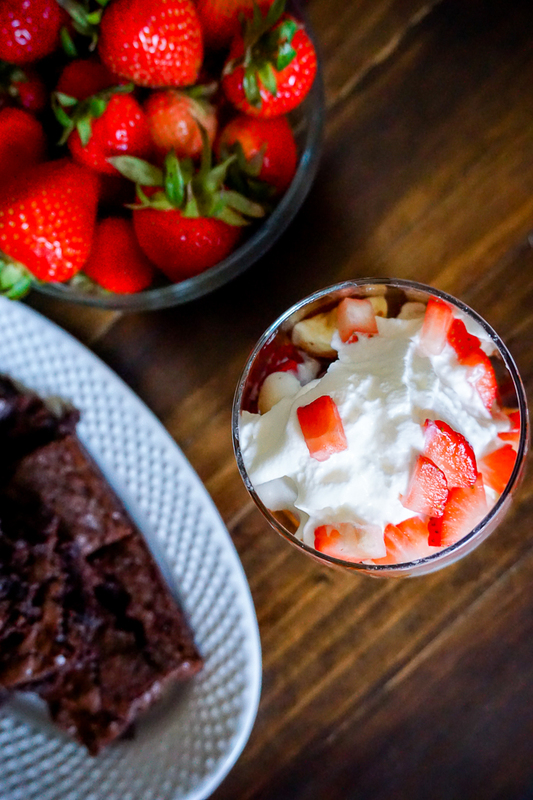 You still get the richness of the chocolate brownie paired with cold ice cream (the best for warm weather) and fresh fruit! Plus they are easy for a group. The brownies can me made in advance and the fruit only takes a minute to dice up. Everyone will love these!!! I always find comfort and fun cooking in the kitchen whether it’s just me or whether I’m with family and friends. Sometimes it’s the comfort of routine. Sometimes it’s being able to accomplish a task from start to finish in a short time. And sometimes it’s being able to mix up an ordinary moment into something fun and special. Make the brownies from the box directions and let cool. When ready for sundae, layer brownie, ice cream, and other toppings. Then repeat until you reach desired amount. Finish off with whipped topping and enjoy. 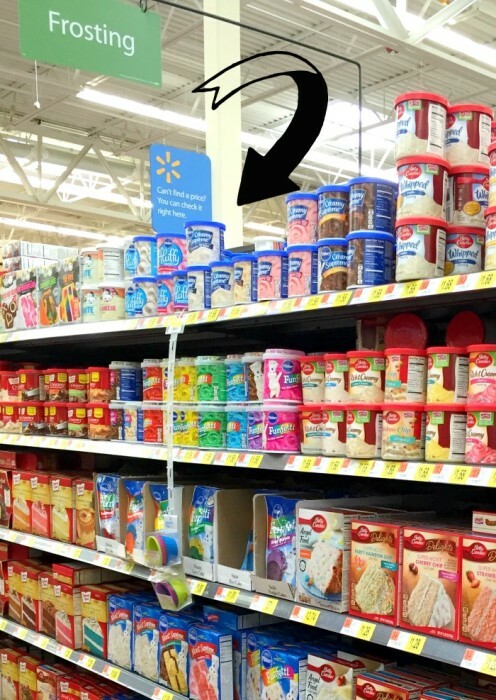 Make sure you head to Walmart to stock up on your own Pillsbury Cake Mixes so you can start making cookies, decorating cupcakes, and whipping up waffles like my Devil’s Food Cake Mix Waffles! You can check out more ways to cook with Pillsbury on Pinterest. Plus, I even have a way for you to SAVE MONEY while doing so! Sausage – It’s Not Just for Breakfast!